What was this email in our inboxes? An event at a brewery? More to the point, a four-course meal? With both beer and wine pairings? Crowds of other people who also like both beer and wine? Bien sûr! It was like someone custom-made this event for Nellie and I. We bought tickets as soon as we heard about it, and on Thursday rushed down to the Distillery District to enjoy the festivities. 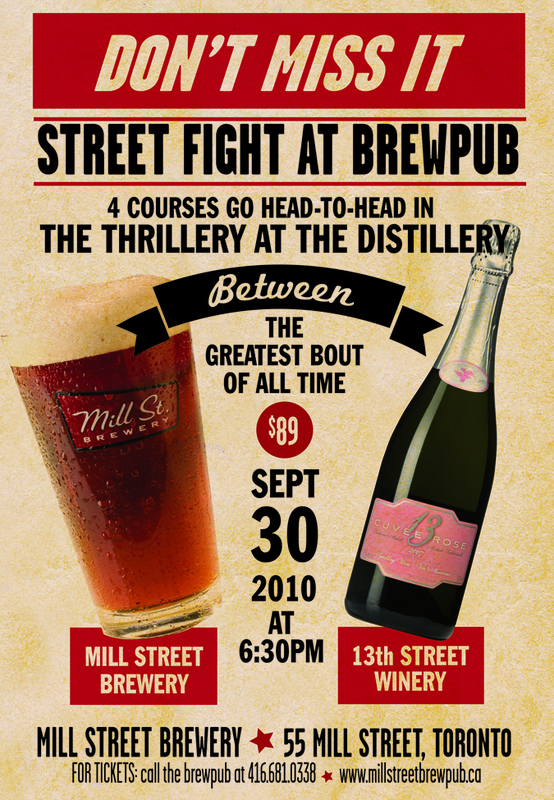 This was the second competition (well, third really, but the first wasn’t publicized) between the Mill Street Brewery and 13th Street Winery (hence the name of the event: “Street Fight”) wherein the beer and wine would be evaluated on how well they paired with each course by a panel of judges (officially) and the 60-odd participants (unofficially). Let the games begin! The staff brought around several sample-sized glasses of beer and wine before the meal even got started. Eventually the appetizers arrived — artichoke and oka cheese fritters with tarragon aioli…tasty! By this time the tables were starting to fill in. Most people were attending in large groups, including the group of four to our right (who we talked to about good places in Ottawa, like the soon-to-be-open Mill St. Brewery, and Les Brasseurs du Temps across the river in Hull), and the group to our left who all work at Opera Bob’s, a pub on the west side of Toronto, and who entertained us for the entire evening. For example, there was a particularly humorous tale about a beautiful Indian lady and some snowballs. Et cetera. Then the meal really kicked into gear. The first course was two huge chunks of wild boar sausage, paired with a Franconian Bock. And paired beautifully, I might add. By the time I finished mine (and a good part of Nellie’s) I was pretty much stuffed. Then came the main — a huge piece of duck with butternut squash risotto on the side, paired with a Gamay. I’m not the biggest Gamay fan, really, so while I quite liked the duck, I didn’t love the pairing. I was stuffed, but there was a cheese course to eat. Three cheeses, one of which worked well with the wine (a Merlot; eep!) and two of which went better with the beer (an IPA). So…whew! Great. I’d managed to eat it all, despite being so super-full. All in all a very good meal, so have a good night everyone, and we’ll see you all next t…what’s that? What did you say? More? Seriously? There’s more?!? As in, more food? MORE food?!? Yep. More food. Very well then. A soldier does his duty. It was an apple & rhubarb crisp and was actually quite good. The wine it was matched with (somewhere between a late harvest and an ice wine) was good, but the vanilla porter was excellent. So…in the end, we both thought the beer got the better of the wine on the night. The judges, of course, ruled it a draw, but all the opinions I heard around the room leaned toward beer as victor. 13th Street does have some very good wine, but I’m not sure we saw the best of it in this competition. I look forward to them coming out swinging in the next match.